Cornerstone VNA is offering a free training for individuals interested in becoming a hospice volunteer. For as little as 2-4 hours per week, volunteers can offer companionship, respite care and their own unique skills to patients and family members in their community. This comprehensive 8-week Hospice Volunteer Training program focuses on how to provide comfort, support and a reassuring presence to Hospice patients and their families. No medical or volunteer experience is necessary to make a positive difference. The next training will begin on Thursday, September 6 and will take place every week until October 25 from 1–3pm at the Portsmouth Public Library, 175 Parrott Ave., Portsmouth, NH. 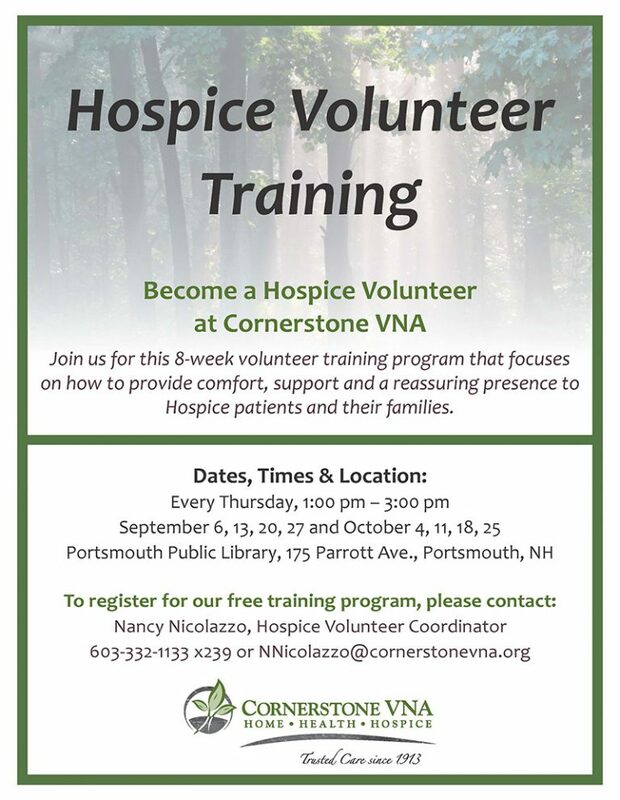 To register for this training or for more information about the Hospice Volunteer Program, please contact Nancy Nicolazzo, Hospice Volunteer Coordinator at 603-332-1133 x239 or NNicolazzo@cornerstonevna.org. Is Hospice the Answer? Here’s How to Tell It’s Time.